There’s a monster in my garden! 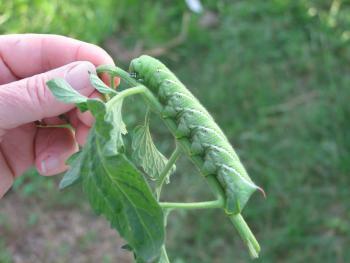 Tobacco hornworm-these very large caterpillars will decimate the foliage of a tomato plant overnight! The tomato hornworm is nearly identical except that it has a black tail. The adult is a large moth. 1. The Texas two step-pick and squash! 2. Bt-Bacillus thuringiensis organic powder or spray. 3. Try feeding them to your chickens-my bantams were afraid of these monsters! They will eat pentas, too! Horn worm These guys make the sphinx moth. I give them one plant and they stay off the other plants. Sometimes I put them on Angel Trumpet and they are happy. The battle aiagnst global climate change was kicked into a new gear this month, and Michigan is leading the charge. That's right: Michigan. The so-called rust belt state that has been putting cars, trucks, and SUV's on the road for over 100 years is putting the pedal to the metal on making the U.S. less reliant on fossil fuels. As Governor of the state that has been ground zero for the nation's economic crisis, I was proud to stand with leaders of the UAW and ten automakers as President Obama announced a truly historic, aggressive national agreement to lower greenhouse gas emissions from automobiles.